Renowned for his sharp wit and observational humour, Cyril Kenneth Bird (Fougasse) was one of Britain’s most influential illustrators. His formal art training was by way of evening classes, which he attended alongside completing a degree in Engineering. Severely injured by an explosion in the First World War, and unable to walk for three years, he continued his art lessons by correspondence. In 1916, Punch published his first cartoon, entitled ‘War’s brutalising influence’. He adopted the pseudonym ‘Fougasse’, meaning small unpredictable landmine, which he used for all subsequent work. The Second World War marked an increase in newcomers to London, many of whom were unused to Underground travel and the behaviours that, while familiar to regular users, were strangely confusing to the uninitiated. A code of conduct helped to keep passengers safe and services running smoothly. Fougasse’s wry observations and comic style were a refreshing antidote to the more strident tone of government wartime notices of the period. Fougasse produced a number of public information posters for London Transport between 1925 and 1945. 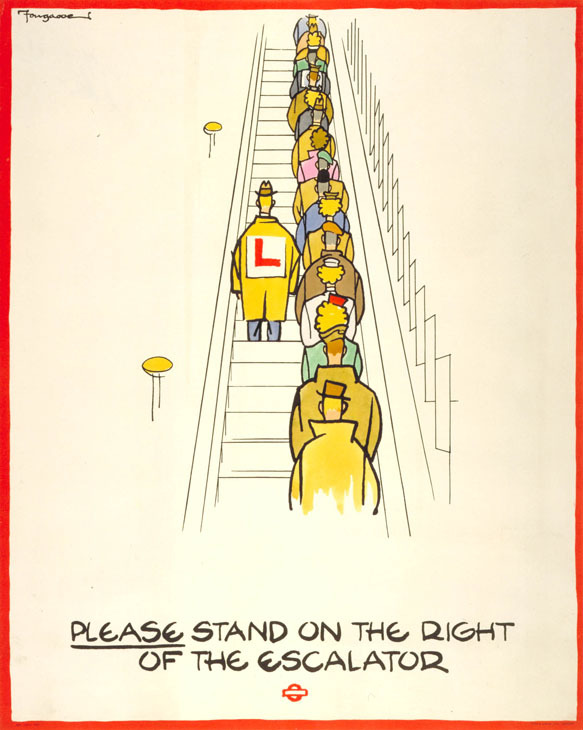 This poster is one in a series called ‘Rules of conduct’ and instructs passengers to ‘stand on the right of the escalator’ – one of the numerous slogans that were to become part of an emerging Underground etiquette.